Some moments in life provide such extraordinary images of courage and hope that they demand to be celebrated. The 4th of July provides the perfect backdrop to acknowledge the sacrifices of so many that gave so much to provide the freedoms that we enjoy in this country. For children in the United States living with and fighting cancer, this fight rages on each and every day. As the 4th of July weekend approached, it is fitting that we celebrate America's freedom through the courage and triumph of 14-year-old Mary Tankersley's declaration of independence from her own cancer diagnosis. Mary personifies courage and poise and is an inspiration through her own fight with childhood cancer. On July 1st, at the Atlanta Braves-Washington Nationals game, Mary walked confidently onto the field and sang a moving rendition of the National Anthem. Freedom is beautiful; however, we must never forget that it is often gained by individuals demonstrating unimaginable courage through trying times. Freedom comes in many forms. As a nation, we have gained freedom through the sacrifices of extraordinary men and women over the course of many conflicts. As our forefathers marched into battle to gain this country's freedom, they did so against an army that was far better equipped and funded. Thankfully, the men and women of the military today are provided some of the most sophisticated weaponry to defend our freedoms. Unfortunately, the same cannot be said about how we equip children to fight for survival against many forms of cancer. Childhood cancer continues to be the leading cause of death of children in the United States. Whereas this fact may be surprising to some, there truly is no shock in this point considering that we continue to treat children with drugs that are thirty, forty and in some cases fifty years old. We would not expect our servicemen and servicewomen to fight for our freedom using such outdated weaponry. Although it sounds cliché, children are in fact the future. Far too many children diagnosed with cancer are deprived of the ability to grow old and live to their full potential. The reality is that the investment into childhood cancer overall is far too low. Currently, less than four percent of the National Cancer Institute's budget is directed to fund childhood cancer specific research. Of the kids who survive their initial diagnosis of childhood cancer, two-thirds suffer long-term and life-threatening side effects from the treatments used to save them. As a nation with the charge of investing in our children and their future, this must change. Mary provides inspiration for all of us to demand better treatments for kids fighting cancer. 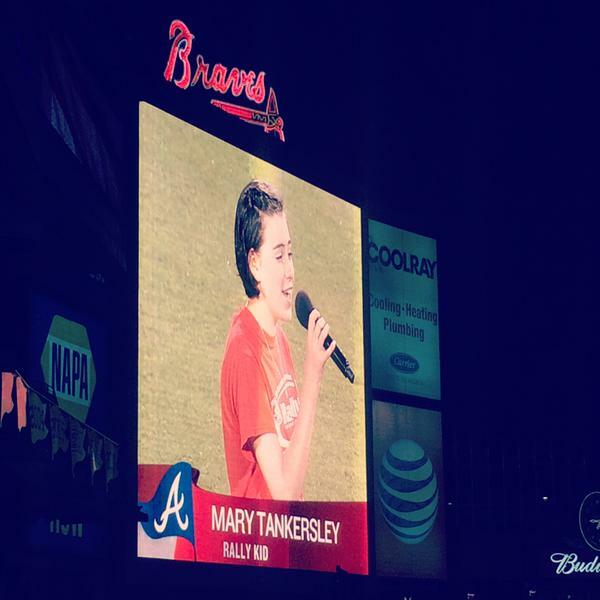 At that baseball game, Mary wowed the rain soaked crowd as she sang the National Anthem. Mary did so while celebrating her second year cancer free. Mary's war with childhood cancer was brutal and included the loss of her leg, the loss of her hair more times than she cares to remember, and twenty-eight long weeks in the hospital receiving a chemotherapy cocktail containing methotrexate, cisplatin and doxorubicin; drugs that are all part of our outdated arsenal. As Mary sang, she launched the 4th of July celebration through her resolute courage, grace and poise beyond her short years on this earth. Mary stood as a reminder that the battle for freedom comes in many forms, with many sacrifices along the way. And, more importantly, she also reminded those of us dedicated to children with cancer to continue the fight to ensure that childhood cancer gains the investment on a national level that it deserves and currently lacks. Just like that "flag that was still there," so too was Mary, declaring her own sense of independence.